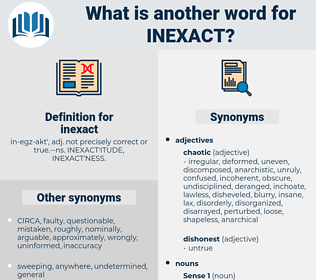 What is another word for inexact? in-egz-akt', adj. not precisely correct or true.-- ns. INEXACT'ITUDE, INEXACT'NESS. mathematical, dead, positive, demonstrated, irrefutable, impeccable, factual, certain, unqualified, supported, incontrovertible, defined, established, indisputable, indubitable, valid, unquestionable, incontestable, corroborated, validated, confirmed, sure, definable, sound, determined, undeniable, proven, decisive, errorless, tested, substantiated. block, bound, close up, compact, confine, conservative, conservativist, detain, even, impede, jam, obstruct, obturate, occlude, smooth, square, tight, unfree. It is inexact to say that Mme. A third map of the moon was executed in the seventeenth century by Dominique Cassini; superior to that of Riccioli in the execution, it is inexact in the measurements.